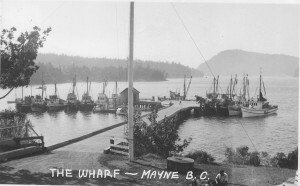 For over 140 years the Miners Bay Dock has been a cornerstone of our community. Historically it was the main access point to the island, where goods, people and materials were shipped onto and off the island. Today it remains one of the key components of our community. This is where our mail arrives and leaves, island children access the school boat, patients are Medivac’d off on the ambulance boat, our hydro crews arrive to restore electrical outages, commuters use water taxis and seaplanes – the list goes on. All of our lives are impacted in one way or another by the dock. It’s not just a facility utilized by a few boaters for social purposes that seems to be the impression of some individuals on the island. The dock is managed and maintained on behalf of islanders by the CRD Southern Gulf Islands Harbour Commission. Year after year our taxation has increased, while maintenance has all but stopped and the dock falls further and further into disrepair. As an example, CRD documents obtained through a Freedom of Information request show that in 2014 the Harbour Commission spent a total of $9,485.41 on the administration, operation and maintenance of the dock. Clearly we are being over taxed and/or underfunded for this operation. (Since 2005 approximately $600,000.00 in direct taxation from Mayne Island taxpayers, $80,000.00 in user fees and $375,000.00 in contributions from the Federal Government to maintain the Miners Bay Dock has been received by the CRD. However, CRD has spent only a total of $452,166.00 on capital improvements on the dock to August 2013 – the bulk of this work having been done in 2007 to a value of $414,546.46). In recent years, there basically has been no day to day maintenance (Painting, salting for ice, pressure washing etc) taking place on this dock, scrap plywood is being used to cover holes in the decking, pilings are rotting away and the only effort being made by the CRD is to use our money to commission engineering reports that confirm the dock is not being maintained and something needs to be done. This entry was posted on Tuesday, January 19th, 2016 at 3:13 pm and is filed under Web site news. You can follow any responses to this entry through the RSS 2.0 feed. Both comments and pings are currently closed.